Following the success of our Grey Wolf design, we added this black and grey version, which appears to be becoming equally as popular. 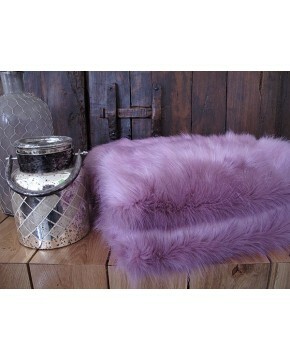 A good all-round faux fur throw for sofas and chairs, and pets appear to love it too! The smaller sizes can be machine or hand washed, although we recommend the larger and heavier sizes are dry cleaned. If it is to be used on a white or light coloured sofa, please request the ivory coloured backings. Although available in 9 sizes, please contact us if you require a special size. The Black Wolf faux fur is a striped fabric and the stripes run the length of each throw. So for example, a 150cm wide x 250cm long throw will have 250cm long stripes running down the length of the throw. We always give the width of the throw first, and so a 200cm wide x 275cm long throw will have 275cm long stripes. With some size options it may be possible to make your throw with the stripes running across instead of down the length, but you would need to contact us to discuss your requirements before placing the order. However, on a 150 x 100cm thrrw (59" x 39") the stripes run across the width, so are 100cm long. VERY PLEASED WITH MY PURCHASE, MY DAUGHTER IS OVER THE MOON WITH IT. STUNNING, BEAUTIFUL AND OMG WAS HER REACTION WHEN THE THROW ARRIVED. THANK YOU. 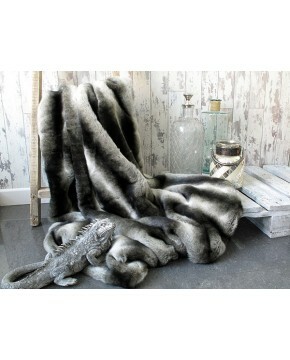 Description: Our Black Wolf faux fur throw comprises black and grey fur in a striped design. Very competitively priced and ideal for many situations. A medium length faux fur. An easily maintained faux wolf fur throw or wolf fur blanket.